A recent article i read about the ending of typewriter production in the UK (though to be honest i was more surprised by the fact it was still ongoing) have spurred me to get a typewriter of my own. I am a sucker for certain types of "retro" technology (dial phones for example which i still use) and when i saw a typewriter on eBay i knew i had to have it... and yesterday i received it! 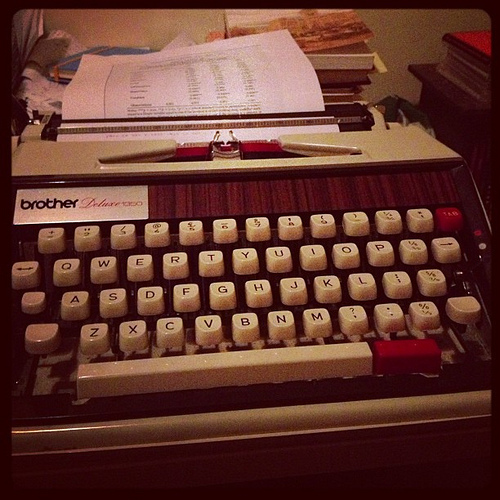 Its a Brother Deluxe 1350 to be exact and its lovely with the kind of 70s retro styling i love, and it works fine too. I probably won't be typing out my course work on it though, i think i'll stick to my Mac and Pages... I apparently can download a matching font though.